September is half over which is just about the time I start thinking of all the things I want to bake with apples and pumpkins. 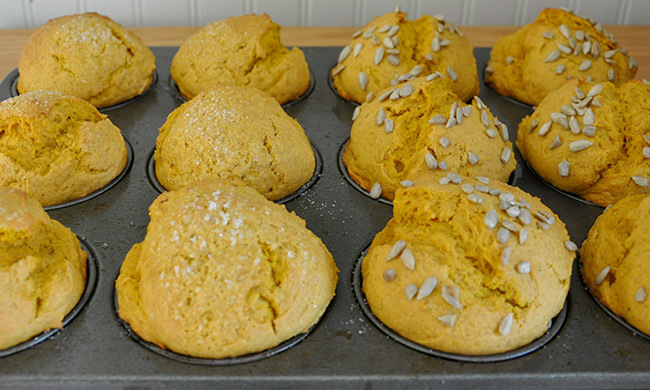 I have made many different pumpkin muffin recipes throughout the years, but this one stands out as something really unique and special. These are extremely light muffins in character and the topping of sunflower seeds adds a nice little crunch. This recipe is adapted from the book Sarabeth’s Bakery. I have modified the ingredients to my own liking, but the method is hers, and I find that it really does create a wonderfully light and flavorful muffin. Preheat your oven to 400 degrees and position the rack in the center. Butter the insides and the top of a 12-cup muffin tin with softened butter the lightly sprinkle with sugar. Sift the flour, baking powder, cinnamon, ginger, nutmeg, and salt together into a medium bowl. Beat the butter in the bowl of a heavy-duty stand mixer fitted the with the paddle attachment on high speed for about 1 minute. Gradually beat in the sugar, and continue beating, scraping the sides of the bowl often with a silicone spatula, until the mixture is very light in color and texture, about 5 minutes. Gradually beat in the eggs. Reduce the mixer speed to low. Beat in the pumpkin; the mixture may look curdled. In thirds, beat in the flour mixture, scraping down the sided of the bowl often, and mix until smooth. Increase the speed to high and beat until the batter has a slight sheen, about 15 seconds. Fill the prepared muffin tin with the batter. I like to fill the cups almost to the top; that way my muffin domes over the top of the pan. Sprinkle the tops with sunflower seeds. Bake for 10 minutes. Reduce the oven temperature to 375 and bake until the tops are golden and a toothpick inserted into the center of a muffin comes out clean or with only a few crumbs clinging to it. This will take about 15 minutes more. Cool in the pan for 5 minutes before removing them to a wire rack to cool completely.